Looking at purchasing a 1/2 Router with plunging capability, anyone have any good suggestions ? I assume you mean 1/2” shank router? I have both triton routers 2.25hp and the 3.25hp. They both are great routers… the 2.25hp is much lighter and easier to use by hand. The 3.25hp I have dedicated in my router table…I love the built in lift feature. itself are robust and well designed. The Dewalt 618 is my favorite plunge router of my current fleet of about nine routers. I have tried Bosch, Porter Cable, Craftsman, Freud and Makita. The Dewalt stuff is really special because of the Elu patent that Loren alluded to. I’m a big fan of my Bosch 1617. I wouldn’t really recommend the Ridgid combo set I had until I got the Bosch at a recent auction. The Bosch is much lighter but just as powerful, and the plunge action and ergonomics are better. The Bosch also has more options for dust collection. I m a big fan of my Bosch 1617. I wouldn t really recommend the Ridgid combo set I had until I got the Bosch at a recent auction. The Bosch is much lighter but just as powerful, and the plunge action and ergonomics are better. The Bosch also has more options for dust collection. Had my 1617evs for about 4 years now, and still love it. I bought the edge guide and now use it in the plunge base whenever I’m routing dadoes or milling mortises for loose tenons. I keep the fixed base under my router table extension and just swap over the motor when necessary. Lotsa great choices. For table use, get one with ample power and variable speed (top side features are handy too). For hand use, get one that feels good in your hand. I’m really fond of my Milwaukee….runs strong, has an excellent plunge base. The Bosch, DW, PC, Makita are all well proven. I also like the Hitachi on sale for value….light and quiet. Most of my routers are PCs. Great routers but, all are at least 20 years old. I wouldn’t recommend the newer ones. If I needed one today, regardless of size, I’d be looking at Milwaukee and/or Bosch. Gene, like you, I have PC routers. Two of them, the cords and strain reliefs have just turned brittle and started crumbling. Have yours done anything like that? They’re not even out in the light of the shop or heat of any kind, they live mostly in a drawer of my Norm router table. Bosch MRC23 is arguably the best router ever made. Trigger switch in the handle alone worth half the price. Get the one in the link with both bases. Attach the fixed base to the router table and keep the plunge base for the hand routing. I love my Bosch 1617evs. 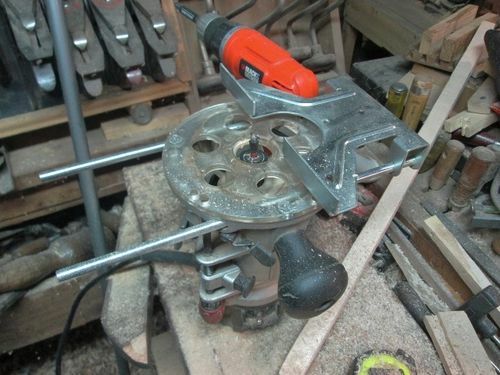 I have both the plunge and fixed base, but rarely use the fixed base…I actually keep the fixed base in my router table. Dust collection is great with the dust attachment accessories that are sold separately for about $35. Ditto. I can honestly say that I’ve never had a router in my hands and wished it were heavier/more powerful, but I’ve said to myself, “self, I wish this router were lighter and easier to handle” a lot. My Ridgid is too heavy and too awkward, where the 1617 is as heavy as I’d want a 1/2” collet router to be. IF you can find a Sears store still open….walk in and buy their 2hp “kit”.....the one with the red top. I’ve had the black version for a LONG time. Come with both a fixed and a plunge base. Also has both a 1/4” collet and a 1/2” one. Mine cost $170 out the door . IF you want, I can go and look up the model number,...looks like a Bosch made router..
I’ve got a PC 690 kit from about 20 years ago. Same issue with the cord and strain relief turning brittle. I hate the plunge base and dislike the tightening knob on the regular base. Dislikes aside, it gets the job done and I can’t see replacing it. Although I’m contemplating a palm router. I’ve also got a PC jigsaw of the same era with the same cord issue. While I’m bragging on my 20 year old PC gear, I just retired two PC nail guns as internal parts were brittle and non functional. I like the Hitachi handheld router set I have, if you can get a better deal on one of those sets than the “premium” brands I totally recommend it. I would NOT buy a Craftsman if you plan to use the plunge base. I had one with the red top, and was really impressed with the motor being quiet and smooth running, but in a single afternoon of plunge-routing mortises the base loosened up and became sloppy, which gave me bad cuts & burning. To figure out what was going on, I set it on the bench and applied pressure side to side (like when cutting mortises) and it would deflect significantly. Took it back for refund the very next day.